There have been a myriad of changes to the Community Medicaid program over the past year, none of which has been favorable to the elderly and disabled. Budget cuts and capitated rates have had a tremendous negative effect on our aging population, making care in the community and aging-in-place far more difficult. The latest hit comes in the form of an onerous and burdensome managed Medicaid internal appeal requirement. A decrease in funding has caused many Managed Long Term Care plans (“MLTCs”) to exit the marketplace, including the largest plan providing home care services on Long Island. As a result, numerous recipients of community Medicaid benefits have had to enroll with other MLTCs, requiring new evaluations and often leading to a reduction in services or even elimination of services altogether. Many enrollees receiving split-shift home care services (two aides working 12-hour shifts) had their services reduced to 24/7 live-in care. This difference is significant: instead of having two aides providing services around the clock, a single home health aide who lives in must be provided meal breaks and ten (10) hours off, including hours of uninterrupted time to sleep. However, such reductions in services could be challenged via a Department of Health Fair Hearing – until now. Historically, MLTC enrollees who disagreed with a service decision or any change to their benefits could request a Fair Hearing directly from the State Department of Health without first requesting an internal appeal with the MLTC plan. Of critical importance, if the enrollee requested aid continuing with their request for a Fair Hearing within ten (10) days from the date of the notice, their current service level was maintained during the pendency of the Fair Hearing. As it can take several months for a Fair Hearing to be scheduled and many more months for a decision to be issued, the provision of services at current levels during the pendency period for elderly clients has been paramount. The plan’s truncated notice requirements will be onerous and extremely detrimental to clients. The managed Medicaid plan need only mail notice to the client ten (10) days before the effective date of the intended action (i.e. the reduction or termination of services). The client must request the internal plan appeal within these same ten days in order to preserve their appeal rights and secure the all-important aid continuing. Alarmingly, the ten (10) days includes the mailing time and includes weekends and holidays. This could potentially leave a single business day within which a Medicaid recipient must reach an appropriate person at the managed care plan in order to protect their appeal rights and aid continuing. This further assumes that an elderly person gets to their mailbox every day, does not need a family member or loved one to assist with opening or reading or understanding their mail, or has the wherewithal to react immediately to such a notice. Further, reaching the right department or person at the managed care plan may well prove problematic. MLTC plan members will call a toll-free number that handles all managed care issues, not just internal appeals. No two plans are the same; some will handle internal appeals via their calls centers, others via case managers, others via various other departments. We all know that toll-free callers can be placed on hold for incredible amounts of time, that calls get routed, re-routed, disconnected, etc. With only a critical day or two to spare before appeal or aid continuing rights are permanently lost, this type of normal day-to-day aggravation can prove fatal. As with so many other issues in Elder Law, capacity will rear its ugly head in this case as well – here, in terms of authority to request an internal plan appeal. Federal regulations require managed Medicaid recipients to give written consent in order for a representative to file an appeal on their behalf; “If State law permits and with the written consent of the enrollee, a provider or an authorized representative may request an appeal or file a grievance, or request a State fair hearing, on behalf of an enrollee”. [iv] The problem, of course, is timing: if a family member has but a day or two to request an internal plan appeal and aid continuing on behalf of a loved one, they may be left scrambling to locate a Power of Attorney, secure a signature on a consent form during a moment of lucidity, or file an emergency guardianship petition — none of which are ideal or even realistic solutions. It is almost impossible to underscore the impossibility of preserving a client’s rights under this federally mandated internal appeal requirement for managed Medicaid plans. Educating our clients and their loved ones is the best offense so they are informed and know where to turn for help. Jennifer B. Cona and Melissa Negrin-Wiener are partners at the Elder Law firm Genser Dubow Genser & Cona in Melville. They are advocates, thought leaders and educators for both the public and professionals in the field of elder law and elder care. For more information, visit www.genserlaw.com. [i] While the regulations are effective in New York State on April 1, 2018, New York State Department of Health intends to put them in effect on March 1, 2018. Genser Cona Elder Law is a full service law firm based in Melville, LI. 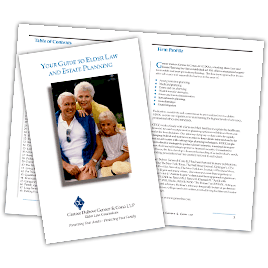 Our firm concentrates in the areas of elder law, estate planning, estate administration and litigation, disability planning and health care facility representation. We are proud to have been recognized for our innovative strategies, creative techniques and unparalleled negotiating skills unendingly driven toward our paramount objective - satisfying the needs of our clients.